ramsesoriginal | Why start a blog? Aren't blogs dead? Why start a blog? Aren't blogs dead? Blogs are dead. Right? They are. The guardian said it. New Republic said it. Forbes said it. Engadget said it. Business week said it. Gigaom said it. Think Progress said it. Gawker said it. ....I could go on. Apparently blogs really are dead. So why (re)start a blog? Is there any value in such an archaic medium? In my opinion, there is. There's a lot of value in it. Let me explain. 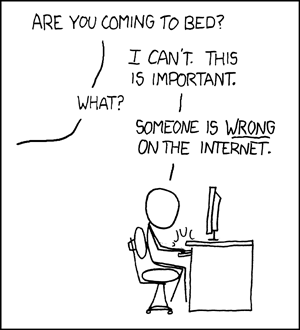 I have to admit something: I like online arguments. I hate flame wars, I hate all kinds of harassment and I hate pointless circlejerks, but I enjoy having a positive discussion, where both parties grow, and where both can learn from the other's point of view. Admittedly, most of the time I seem to be the only one interested in having a constructive debate, I got yelled at, called names, threatened, attacked and I have experienced all other kind of ugliness. But even if only 1 out of 100 discourses lead to personal growth, it was worth it for me. Sadly, most of the time these discussions disappear in some chat log, in some private email exchange, in facebook comments or in a flood of tweets. How often did I have to write the same arguments again? How often was everything I wrote for nothing, and forgotten after a few minutes? The internet allows us to have exchanges of view with hundreds of other persons, that's a mighty good thing, but sadly the signal-to-noise ration is very bad, and good discussions disappear. Sometimes I spend hours researching information and writing facebook comments, only to have the original poster delete his post and my comment with it. Having a blog (or generally a homepage) allows me to keep the constructive stuff. I can summarize discussions, I can copy tidbits of conversations, I can write explanatory texts I can then just copy/paste or link to, I can reference my previous ideas, I can even track my change of mind. And if somebody corrects me on some detail, or points out a flaw in my thinking, or even a factual error, I can write that down, I can correct the erroneous statement, and stop myself from involuntarily spreading misinformation. I can even add details in a later moment, to clarify a point, or to solidify my position. Most of the time I'm very happy if I have the ability to have a meaningful discussion about something I wrote or created. Comments on a blog post are an excellent way of having that, since it allows to have a good discussion, more or less on topic, including a wide array of people. I would go as far as saying that comments are among the top reasons why having a blog is really important. The main argument for having comments on a blog post instead of... say... tweets responding to it, or facebook comments, or something similar, is having moderated comments. The ability to delete a comment, ban a user, turn off comments for an article, or just do any other kind of policing is a godsend. "But ramses, isn't that censorship? ", you ask. No. Yes. Maybe. But it doesn't really matter: my house, my rules. You can still express your opinion freely on twitter, on facebook, you can write me angry mails, you can make youtube videos, create whole subreddits about my posts, whatever. But this is my blog, where I post my content, and I'm gonna moderate the discussion here as I please! Will I be strict? No. Will I delete who disagrees with me? Certainly not, that's the point of comments. But if you post something that I consider not suited for my blog, I will delete you. If I see the discussion derailing, I will prevent further comments from being posted. And I am also willing to turn off comments entirely for certain pages, if I see that they're just abused. I am not sure what to do about this. Might need my blog to write things out of my system. How often can't I concentrate on anything because something buzzes in my mind? How often do I spend hours just trying to get away from a topic, but my brain keeps spinning around it? How often is there something that's bothering me, and is preventing me from being a functioning human being? In this occasions, writing down my thoughts, having a place to post them, really helps. Sometimes I just have to get it out of my system, write down everything, and my mind clears. Sometimes I build up real anger inside, and I have to be careful not to express that with people around me. Having a channel to just post everything, without limitations, helps a lot. A recent example is my recent #StopGamerGate2014 rant on twitter, where i posted a long string of 40 tweets, because I couldn't hold it in any longer. I'd have had a lot more to write about, but I already spammed way too much. I need a blog so I can just write this down, in a safe space, where I don't clog anyone's feed, while still having the ability to share it, if I decide to do so. Just the simple act of writing down thoughts is already therapeutic, and helps me not only organize my musings, and stop worrying about it. It's incredibly beneficial to just let go, try to formulate meaningful sentences, and write. When it's written down and published I know it's archived, and I can stop thinking about it. It's like magic. I can only recommend it to anyone. It's also surprisingly liberating to just write down something without seeming a like-whore, without worrying about hashtags and shares, without having size limitations, without worrying what circle to publish it in, without fearing to go against some rule and getting banned, just write. Let the pen (or keyboard) flow freely, and express myself as it comes natural. I can switch languages in the middle if I want to, I can swear, I can include images or animations, I'm free to do whatever I like to do. That's simply awesome. Martin Freeman as Watson in Sherlock, demanding that everyone shut up for once! There are issues that are important. Issues I don't want other tweets to move it down the timeline. Issues I don't want it to be visible only to facebook friends. Issues I have more then 140 characters to write about. Issues I don't want an algorithm do decide if it's worth reading or not. Issues distractions have to be taken away, where I just want to talk about them, and give them the proper visibility they deserve. Sure, a tweet might have more reach. Sure, a facebook post might be easier to interact with by people that have me as a "friend". But there are topics that deserve more than just some post in the social network of choice. Ideas where I want to be able to craft the proper message, without being restricted by the platform of choice. Messages where I might want to provide multi-language information. A blog post is one of the best ways to deal with these topics. It also allows me to share the information, to modify it, to have follow-ups, to keep the content current. Spoken word has its merits. But in my opinion having a written text is way superior: it's searchable, you can copy-paste it, you can reply to parts of it without interrupting, you can read it at the speed you want, fact-check, you can even just jump over parts. Having a blog allows me to have written logs, or at least summaries, of interesting conversations I have, or I simply am part of. If I see something interesting, I can write it down. If I have a few ideas that could be cool, I can write them down. Typing out experiences, be it something that happened to me, a conversation I listened to on the UBahn, or an exchange of ideas I had, helps me go through it again to see if I didn't misunderstand it, if I really got what it was all about. It's like the saying goes: "If you want to understand something, write a book about it." I don't have the patience and the time to write a bunch of books, but blogposts are achievable. A blog gives me this flexibility, and even more. Since I "built" the blog myself (see my previous post about the topic for details) I can do whatever I want. I can have the music I'm currently listening to displayed in a post. Or have a post that pulls content from a Storify. I can make single-post slideshows, or all kinds of interactive stories through multiple posts. There's nearly no limit to what I can do. I love having this flexibility! Verba volant, scripta manent. That's a truth that hasn't changed significantly over the last two thousand years (yes, sure, podcasts, soundcloud... let's just consider recordings as "written" for the sake of argument!). Even if I have the most amazing ideas, if I don't write them down, they don't exist. And it's important that this written information is in a safe harbor, where I can have a reasonable control over it, and I know it won't just disappear. Having information preserved for the posterity is so important, and gets neglected way too often. Just ask the guys at the internet archive how many holes we have in our recent history. When they turned off geocities thousands of stories disappeared, forever (most of them probably where buffy fan sites, but that's a topic for another day). Having your own permanent record is one of the most important things you should have. It's your legacy, your memory, your life that you're letting disappear in the ether if you don't have written records. (And if you're not convinced yet, go read Fahrenheit 451, and apply it to modern media). But in today's fast-moving world, with 684 478 pieces of media shared (not posted) on facebook every minute, with 204 million mails sent every minute, with wordpress.com getting 347 new blog posts every minute, 48h of video uploaded to youtube every minute, way over 100 000 tweets sent every minute, with facebook, flickr and instagram receiving over 300 pictures every second, in this world flooded with information, discoverability is nearly as important as permanence. Linkability, searchability, indexability and so on are the basis for the usefulness of the content I create. If people can't find it, link to it, share it with somebody, then it's pointless to publish anything. People need to be able to discover your content, and if you're limiting your presence to a platform, that makes it very hard for people to find you. A blog allows me to have this neutral place where I produce my content, and then just share it to the appropriate places. I like to be useful (and also to feel useful). Since I have decent knowledge in a few fields, and since I'm a knowledge junkie and I'm probably gonna accumulate more expertise as time passes, and I like to share my knowledge, having a blog has a big benefit: I can help other people with my knowledge. Writing tutorials, providing examples, step-by-step-instructions, opinions, explanations, I'm arrogant enough to say my content might have some use for others. Maybe somebody even thinks my ramblings are worth reading, who knows! Sure, I could write tutorials on instructable, or wikihow, or some tumblr, or a thousand other places, but having everything collected here allows me to keep track of the instructions I write, and keep them up to date. A blog allows me to pose questions, and the answers to them as soon as I find them, so that it may help others that have the same problem. If I build something interesting ,I can post step-by-step instructions, with images and videos that go along the text. If I have a problem creating some shader in Unity3D I can post my problem, and then also the solution with a live example. I really hope that this blog will be beneficial to others, and not just to me! Having everything in one place is nice. Collecting shiny things is nice, too (from phone cards to sugar packs, I collected nearly everything I could at one point or the other in my life). The logical extension is to also collect everything online. Turns out that's not so easy: there are highly-specialized services for many things, and not using them would be dumb. Why recreate a reading tracker if we have goodreads and anobii? Why recreate snapshot sharing when we have Instagram? But I'd still like to have a central location where all my content is visible. Guess what? Blogs help solve this too. If I have something I consider worthwhile, I can just make a post embedding it, and voila, by scrolling through my blog you see that awesome timelapse I posted on vimeo! Joel Spolsky's #1 advice for computer science college students is: Learn how to write before graduating. This is the same advice I heard from Frederick Van Johnson about photography. I've heard similar advices from progammers, game designers, musicians, writers (duh...), ... in nearly every field, the most important skills are writing and communication. And if you think about it, that makes all kinds of sense: you will always have to explain ideas, describe them to others, formulate your thoughts, be it in a sales conversation, in a pitch to management, or also just when collaborating with others. There are thousands of blogs dedicated to the benefits of writing, on how writing benefits your other skills (as an example, Jeff Atwood's interesting article about how programming is writing), there's no point in me trying to write about writing, since I have nothing meaningful to add to the conversation. One of the reasons I decided to (re)start a blog is because it's an excellent exercise in writing. It forces me to not only ramble on, and not abbreviate everything like it was an SMS, but to actually write good texts. And with practice comes skill. The "10,000-Hour Rule" applies to writing as much as to any other topic, and I plan to be good at what I do. Who knows, one day I might even be in the position to write about writing. I already mentioned that the blog is a good way to get stuff out of my system. There's a related yet different help the blog gives me: I can just vent. Sometimes I get passionate about topics, and then somebody somewhere says something stupid, and I have no way to replying, and in those cases I need a space to let off steam. I need somebody to talk to, and that person has to endure me rambling on for hours about a topic. For example about starting a blog (yaay self-references). Honestly, I don't want to bother people around me more then strictly necessary. So having a blog where I can just talk to the google bots (probably the only people visiting regularly) for hours seems a good solution. In fact, I'm gonna predict that's gonna be one of the biggest chunks of content on here: Just me rambling on about some obscure topic nobody in real life cares about, like for example how every movie nowadays seems to be just teal and coral, what the heck happened to technicolor? In conclusion we can say that yes, today we have many services that do many things very well, but having a blog/personal homepage is still very important, and definitively worthwhile. I'm sure starting this blog is gonna be a good decision, and I'm not gonna regret it.